The 1600 block of S Street NW. There were six gun crimes in the previous week in the Borderstan area: five were robberies with a gun and one assault with a gun (two of the gun crimes were reported on Saturday). The most recent one occurred last night around 11 p.m. on the 1800 block of T Street NW. As for additional trends, two of the robberies and the assault were on or near Corcoran Street NW between 1300 and 1500. One robbery was in an alley near R and 16th Streets–R is one street north of Corcoran. In addition, the number 13 was truly unlucky in the past week. Check out the number of crimes in the list below that occurred on or near 13th Street or in the 1300 block of a given street, including Q, Corcoran and U Streets NW: four robberies, three assaults and one stolen auto. Regarding the coming of warm weather and more street crime, please repeat after me: I will not talk on my cell phone or listen to my iPod on a quiet residential street after dark… totally unaware of my surroundings… and setting myself up as an easy target for muggers. Following are the crimes of note for the past week–robberies, assaults, burglaries and stolen autos–that occurred March 20-27 in the Dupont – Logan – U Street area. The area is covered primarily by Police Service Areas (PSAs) 208 and 307 with a small slice of the Borderstan area in PSA 305. Circle Dogs is an all-volunteer, non-profit organization partnered with the DC Department of Parks and Recreation (DPR) to provide custodial care of the dog park at S Street Park. 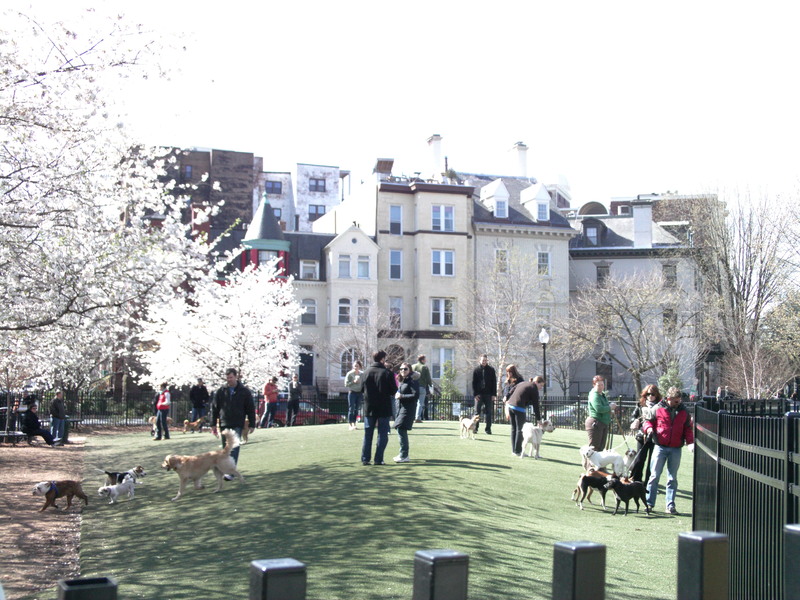 Circle Dogs’ mission, focused on dog parks in the Dupont and Logan Circle neighborhoods, is to provide a safe, clean, and accessible environment for people and dogs to exercise and socialize together at designated dog parks. Before settling down in the Dupont-Logan area more than two decades ago, sculptor Robert Cole lived across the United States– from Cheyenne, Wyoming, where he was born, to Pennsylvania, Louisiana and California. Cole has also lived in both Japan and Germany, and also traveled throughout Europe to experience the art of the region first hand. Family matters eventually brought Cole to the DC area where he began networking with local artists. But it was a club owner in the U Street area that commissioned one of his first metal sculpture projects in the District. Today, Robert’s pieces can be found all over the world, from Maryland and Connecticut to Florence, Italy–where he won a gold medal at the Florence Biannual for his sculpture, “Madre Della Pace” (Mother of Peace). Cole’s metal sculptures are part of the neighborhood landscape with work featured at Studio Cole off 15th Street, in the city dog park at 17th and S Streets… on the front of Dupont Optical, Java House and Adams Bank, all on 17th Street NW. His work is also a fixture at Lotus Lounge and Tattoo Bar, two clubs in downtown DC, as well as the Naylor Road Metro station. Happy Monday, Borderstan. A few things on tap this week, with more to come during the week. Street sweeping and $30 Parking Tickets. If you don’t move your car from a street-sweeping zone on the appropriate day, you will now be ticketed $30–starting today. Sweeping began again last Monday, but there was no ticketing last week. Here’s a fun fact from DC Department of Public Works: “Street sweeping is a major component of the District’s efforts to control pollution from storm water runoff. Routine street sweeping collects a range of pollutants like oil and grease, nitrogen and phosphorus, sediments, and trace metals. Nearly 40,000 pounds of oil and grease, and 3,000 pounds each of nitrogen and phosphorus are removed by street sweepers each month. Cleaning these pollutants off the streets keeps them from being washed into rivers and streams by rainfall.” So move your car and help save the environment. ANC 1B meets Thursday. ANC1B will hold its regularly scheduled public meeting on Thursday, April 1, at 7 p.m. in the Second Floor Conference Room of the Reeves Center at 14th and U Streets NW. A large chunk of the U Street corridor and neighborhood is in ANC 1B. Agenda is online. Learn how to do urban composting. Greater Goods on U Street is offering a class this Saturday, April 3, at 11 a.m. on urban composting. There were two gun robberies last night in the Borderstan area. The most disturbing is the first one, which happened early in the evening at 8:40 p.m.; updated details below. on a very busy stretch of U Street–14th and U, to be exact. One has to assume the area was filled with a fairly large number of people on a Friday evening in the spring. Details on both crimes below; information is from Police Alerts. “The Fantastical” is a group show that opened March 20 at Project 4 Gallery, 1353 U Street NW. Artists are Justin Gibbens, Julie Hughes, Mel Kadel, Jordan Kasey and Sophie Ruspoli. 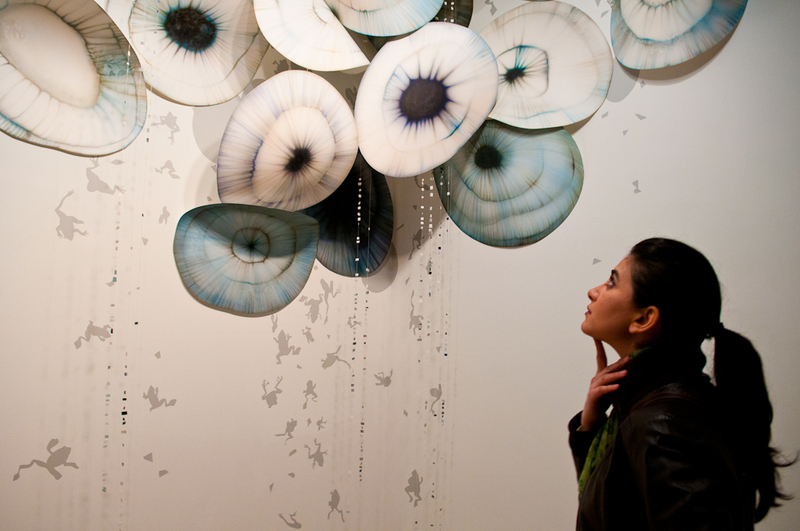 Photos taken at opening reception; show runs through April 17. Project 4 has details. See more of Vincent’s photos of the opening reception. See what City Paper says about Vincent. 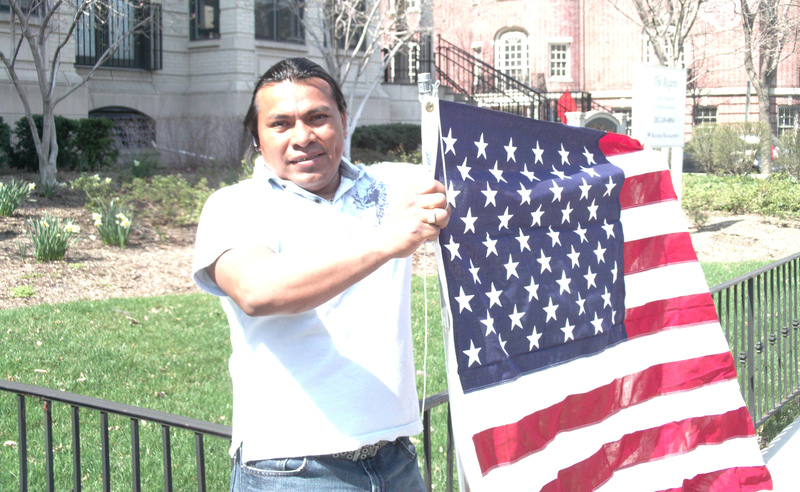 Vincent Gallegos is president of VGDA Design, a web design studio in Dupont Circle. He blogs about art, design and creative living while helping local businesses develop their online presence. You can visit his blog at or reach him directly at [email protected]. “Winter Performance Class Showcase,” is showing at the Joy of Motion Studio, 5207 Wisconsin Avenue NW in Friendship Heights. “Reasons To Be Pretty,” is running at The Studio Theater, 1501 14th Street NW. “Dancing At Lughnasa,” Church Theater, 1742 Church Street NW. The Washington Improv Theater company is doing “FIST” at the Source Theater, 1835 14th Street NW. Looking for something to do this weekend that is close to home? Here is live entertainment at four venues, all but one in the Dupont-Logan-U Street area. Joy Of Motion presents “Winter Performance Class Showcase,” studio to stage: “Latin Fusion, Bollywood, Vegas Jazz, Modern, Aaliyah Tribute, Intersecting Bollywood and Flamenco! Join Joy of Motion Dance Center for a weekend of explosive performances in an array of dance styles – something for everyone!” Joy of Motion is at the The Jack Guidone Theatre, JOMDC in Friendship Heights at 5207 Wisconsin Avenue NW in DC’s Friendship Heights neighborhood (Metro accessible). Robbery (Gun), 2148 hours, 1600 Block of S Street NW. LOF: 2 Black Females wearing puffy hoodie jackets, blue jeans both armed with guns, last seen eastbound towards 16th Street. DO NOT TAKE ACTION. CALL 911 W/EVENT #I20100132077. By chance, we were able to contact and interview the victim of the mugging described above. Here is what she has to say. We refer to her as “Mugged” to protect her anonymity. Borderstan: Where had you been the evening you were robbed? Mugged: At a friend’s house near 13th and Corcoran for a St. Patty’s Day celebration–I was walking home from the dinner by myself. Borderstan: Do you often walk on the 1600 block of S Street… were you in familiar surroundings? Mugged: Very familiar. I live at 17th and S so this was an extremely frequent walk home. Borderstan: What were you doing at the time? Mugged: I was talking to my brother on my iPhone. Read the whole post–and the comments, too. By the way, U Street Girl did nothing illegal or libelous. Moreover, this story is being picked up by blogs all over DC. “14th Street Burger Joint Running Into Strong Opposition.” The burger and beer joint (after the plans for a creperie fell through) planned for the northeast corner of 14th and S NW is running into some neighborly opposition. 14th & You has the story: “Thaddeus Curtz, a cook at esteemed Cathedral Heights pizza place 2 Amys, would like to bring a bit of Manhattan to 14th Street, but things aren’t looking too good for his business plan…” This is the former site of Garden District, which is now at the southwest corner of the intersection. Concern about man walking around with rabid raccoon. This, of course, comes under the heading of “Stuff You Cannot Make Up.” This story comes to us via Washington City Paper City Desk and Prince of Petworth. From City Desk: “Evidently, a guy and a raccoon crossed paths in the 1300 block of Shepherd Street NW. For some reason, the man picked up the animal and carried it around for a while. Unfortunately for him, the raccoon was later determined to be rabid…” You really need to read the entire post to understand. An iPhone app for Ben’s Chili Bowl? No, I don’t quite understand what they’re looking for either. I will let We Love DC explain it for you. I will note that there is a contest to design the iPhone application for the U Street eatery–so have at it, if you can figure out what kind of app. Or perhaps I am simply old and clueless? A robbery waiting to happen. Read “Spotting a Near Mugging” at why i hate dc. Moral of the story: Call the police when you see two guys don masks and hide in the bushes on a quiet side street. Street sweeping resumed Monday–but no ticketing until the 29th. DDoT resumed daytime residential street sweeping on Monday. However, tickets will not be issued if you don’t move your car until the following Monday the 29th. But, please move your car: the streets are dirty. New development at 9th and N Streets NW? Douglas Development may be planning something for this corner, which is currently occupied by Old City Green. Renew Shaw has details. You could fit all the world’s people into 70% of Texas if the density was the same as Brooklyn. I assume there would be bike lanes. Seriously, I love the stuff that the contributors at Greater Greater Washington publish about urban planning, transportation, etc. Some of it is quite dense for my limited background in the subject area. But, here is a fun one from today: “The granite nation: What if all 300 million Americans lived at the population density of Brooklyn. Where could we all fit? New Hampshire. Ryan Avent adds more statistics: The U.S. could fit the entire world’s population at the density of Fairfax County, or inside 70% of Texas at Brooklyn density.” The links are great reads. Mary the Borderstan Movie Fan’s column on movies runs every two weeks. 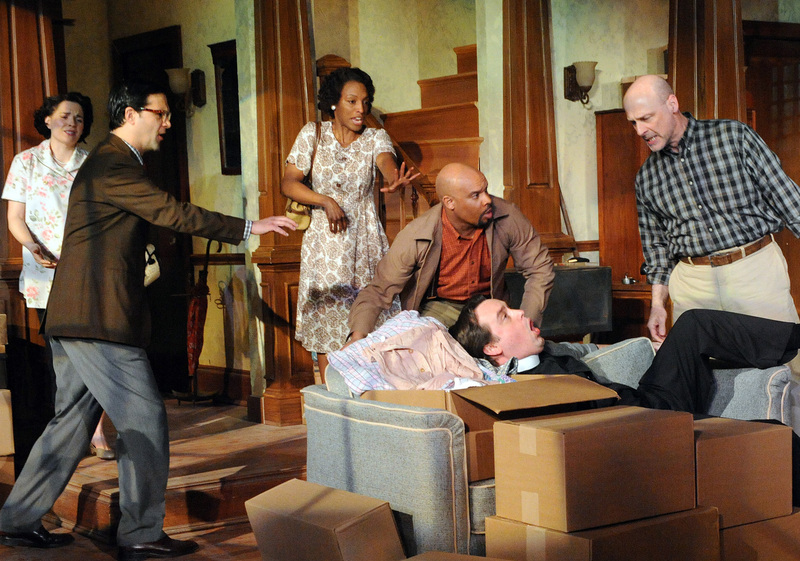 This week, however, Mary reviews a play that is running at Woolly Mammoth Theatre Company: Clybourne Park. For more information about the play and how the theme and plot relate to the Logan Circle-Shaw area, see the Friday post, “Woolly Mammoth’s ‘Clybourne Park’ Looks at Gentrification.” Mary and her husband have resided in Dupont-Logan since the 1990s. She is a retired professor of English and association executive. Note on special ticket promotion: Woolly Mammoth is running a special promotion with $30 tickets for Borderstan readers. When purchasing tickets use the code 788. Go to woollymammoth.net for more information and tickets. Clybourne Park cleverly juxtaposes a day in 1959 when a white family is moving out with a day in 2009 when another white family is preparing to move into a house in a near north suburb of Chicago. The first family has sold the house to a black family (possibly the Younger family from Lorraine Hansberry’s play, A Raisin in the Sun), while the second white family is redesigning the same house to suit their upscale notions, though its neighborhood is now mainly black. They are planning a Koi pond in the back yard. In the first act, a couple of neighbors come in to argue against the sale as devaluing all the property in the area. Ignoring the force of a tragedy that has happened in the house, they accuse the white couple of profiteering, disregarding community mores, and opening up the neighborhood to “unfortunate” influences. The second act, 50 years later, features arguments about how the new couple’s yuppie renovation will destroy the memories that black families have made for themselves in the neighborhood. The play pits a black couple against a white couple in each act. In the first, black woman and her working-class husband, who has come to pick her up from work, is a servant; in the second, a younger and more affluent black couple is played by the same actors. They are more articulate than the black couple in the first act, and they make their arguments against turning the house into a McMansion from positions of equality with the white couple who have bought the house. The tables have turned. As drama Bruce Norris’ play works very well, and the production at the Wooly Mammoth Theatre on D Street, near the Chinatown Metro, is excellent. However, I thought the first act, which sets up the problem of block busting had a bit too much broad satire, played too broadly. A total of four robberies to report in the past week, with two of them on S Street, one on T Street and a fourth one on 16th Street NW between S and T Streets. It’s springtime, people. This another reminder to not talk on your cell phone or listen to your iPod… while alone… on a quiet residential street… at night. Don’t do it. Following are the crimes of note for the past week–robberies, assaults, burglaries and stolen autos–that occurred March 15-18 in the Dupont – Logan – U Street area. The area is covered primarily by Police Service Areas (PSAs) 208 and 307 with a small slice of the Borderstan area in PSA 305. Tuesday, March 16, 8:15 p.m., Robbery, 1000 block of S Street NW-Alley. Thursday, March 18, 4:41 p.m., Robbery pickpocket, 1840 16th Street NW (between S and T Streets). Monday, March 15, 1:42 a.m., Assault with a Deadly Weapon (ADW), 1200 block of 11th Street NW-Residence. Wednesday, March 17, 10:30 p.m., Assault with a Deadly Weapon (ADW), 1200 block of V Street NW. Monday, March 15, Stolen Auto, 16th and P Streets NW. The southbound bicycle lane on 15th Street NW has turned into a two-way bike lane and, sometimes, a multi-purpose lane. Southbound cyclists now regularly share the lane with northbound cyclists. In addition, the dedicated lane–between the curb and parked cars on the west side of the street–sometimes hosts rollerbladers, skateboarders, parents with strollers, joggers and motorized wheelchairs. The bike lane opened last November as a pilot program. The lane’s purpose is to give bikers a safe, wide lane between the curb and parked cars to ride southbound on 15th Street–which is a one-way, northbound traffic street north of Massachusetts Avenue. 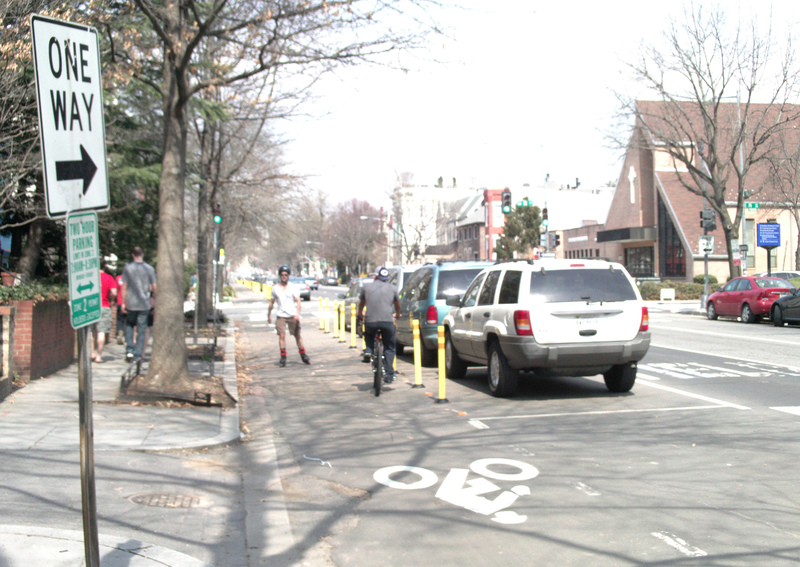 In addition, the city created a shared lane on the east side of 15th Street; the far right lane is to be shared by northbound cars and bikes and there is signage on the pavement to that effect. The dedicated curb-side bike lane grew out of the DC Department of Transportation’s study of what to do with 15th Street: basically, whether to leave car traffic one-way or turn it into a two-way street. The removal of one lane of northbound car traffic has also effectively slowed the speed of car traffic on 15th Street during evening rush hour. One danger to northbound cyclists (and other users) is that there drivers are not looking for them. The signage put up by DDoT with the bike lane only instructs drivers to look for southbound cyclists when turning left off 15th. In addition, pedestrians now have to remember to watch for cyclists coming from the south. Should the city bow to the reality of the situation and turn the southbound lane into a two-way bike lane? Is the bike lane wide enough for two-way bike traffic? Should the city widen it? What about other uses for the lane? Are joggers and rollerbladers a danger to cyclists? Are people using the bike lane for other purposes because the sidewalks are too narrow and/or in disrepair? Marches and rallies are part of life in DC. Because the Borderstan area is close to the White House, Capitol and National Mall, the neighborhood is often a transit point for marchers. Yesterday was no exception. 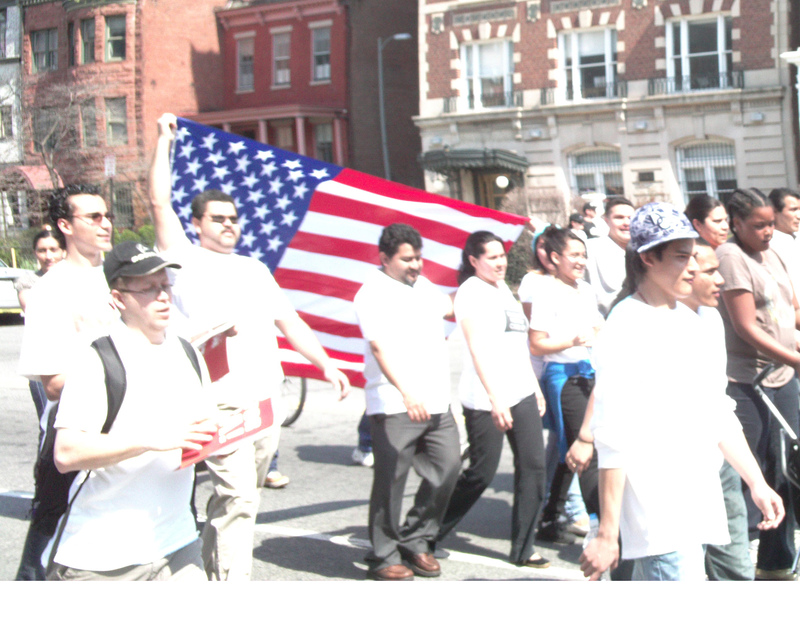 A contingent of immigration reform supporters marched down 16th Street NW from Meridan Hill Park to the National Mall on Sunday afternoon. They were on their way to a rally at the Mall.